This article describes HIV-1 factors and mechanisms involved in neurodegeneration and compares them with those of other neurodegenerative diseases such as Alzheimer’s, Parkinson’s and Huntington’s disease. 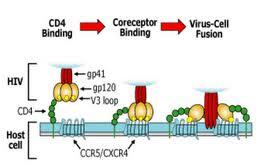 HIV-1 primarily infects CD4+ T cells and cells of the monocyte–macrophage lineage. 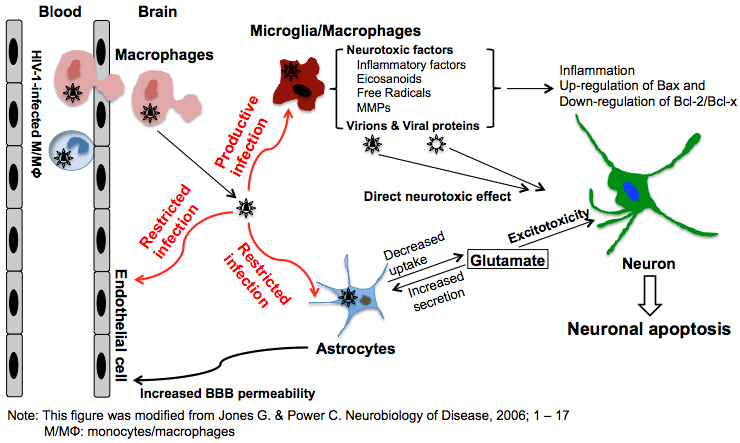 HIV-1-infected monocyte–macrophage traverses the blood–brain barrier (BBB) and enters the central nervous system (CNS) early after primary infection, within 1–2 weeks after viral infection coincident with the peak of viremia. (David et al., 1992)(Eugenin et al, 2011). The integrity of the BBB is compromised by the actions of the HIV-1 virions, viral proteins, and host cytokines and chemokines acting at both sides of this barrier. This compromise results in disruption and dysregulation of the normal function of the BBB, allowing more rapid and greater entry of free HIV-1virus and HIV-1-infected cells into the CNS. (Marianne Strazza et al, 2011). Once in the brain, both free virus and virus-infected cells are able to infect neighboring resident microglia and a small population of astrocytes. 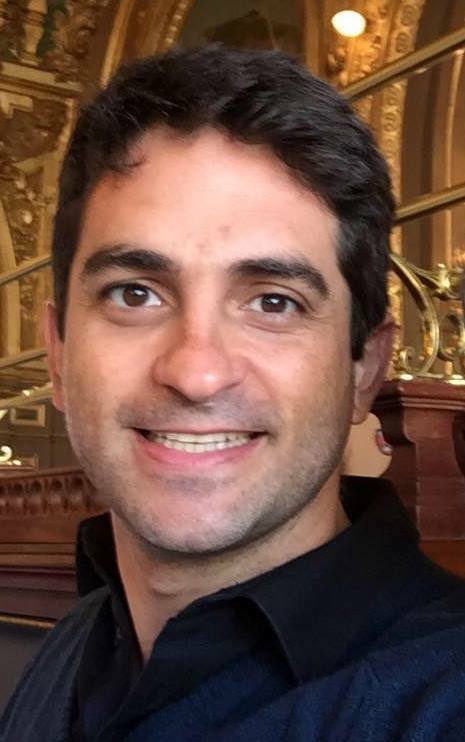 (Eugenin E.A. et al, 2011). 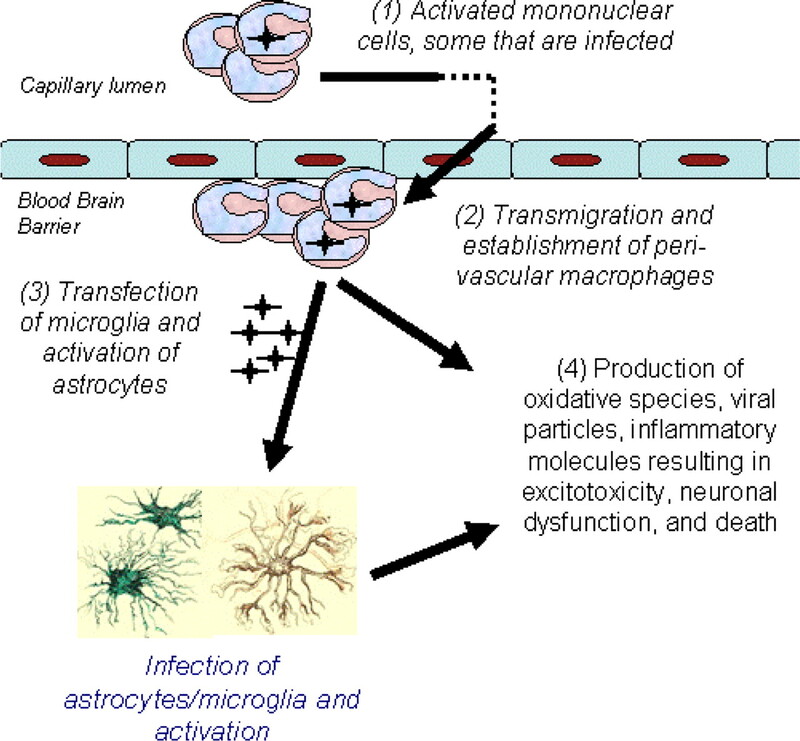 The virus invades the nervous system, first causing glial neuroinflammatory responses and second, neurodegeneration. These mechanisms are critical in producing cognitive deficits and behavioral and motor disorders (Prasanta K. Dash et al, 2011). The mechanisms can be divided in three groups: those dependent on viral factors, which are proteins encoded by the viral genome; those dependent on host factors, such as cytokines and chemokines; and those dependent on behavioral co-factors, which are social or behavioral characteristics (Ellis et. al, 2009). Viral factors that lead to neurodegeneration have been studied ever since the discovery of HIV. The ones best established to cause injury to the CNS are glycoprotein 120 (gp120), trans-activator of transcriptase protein (Tat), viral protein R (VPR) and negative factor (Nef). These factors are responsible for different mechanisms that lead to neurodegeneration and which can be divided into several groups: Damage to the Blood Brain Barrier (BBB); Excitotoxicity; Oxidative Stress; Mitochondrial dysfunction; Calcium deregulation (Strazza et al. 2007); Signaling alterations; and defective protein quality control (Kragh, 2012). Each protein and its known mechanism will be considered in this article. 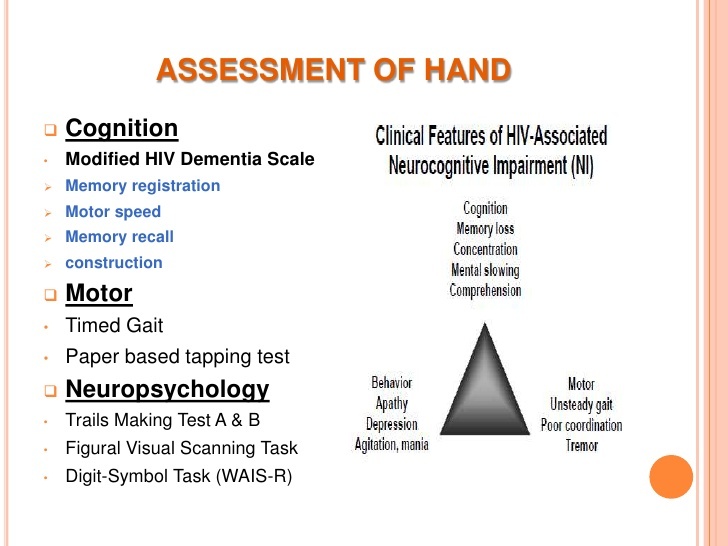 HIV-1 Associated Neurocognitive Disorders (HAND) remain the most common CNS disease linked to advanced viral infection despite the widespread use of antiretroviral therapy (Prasanta K. Dash et al, 2011). The prevalence of HAND seems to be increasing and the main reasons for this may be advanced aging in subjects infected with HIV and increased lifespan afforded by combined antiretroviral therapy (CART). Before the advent of CART, frank dementia or encephalitis were common, now they are rare (Hangxiu Xu et al, 2011). 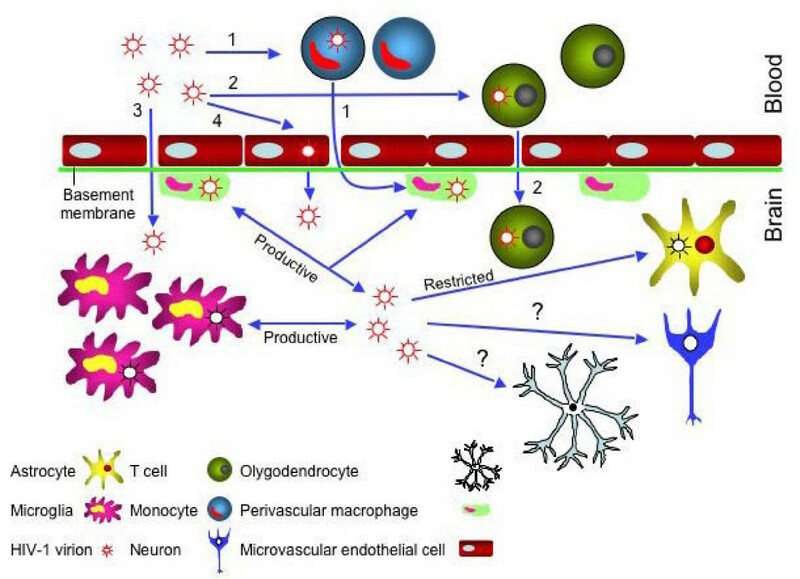 The current model of CNS infection centers around infected circulating monocytes crossing the BBB during all stages of the disease. After entry into the CNS, monocytes repopulate the resident macrophages. The most predominant cell types productively infected by HIV in the CNS are microglial cells and perivascular macrophages. A small population of HIV infected astrocytes has also been detected. (Eugenin E.A. 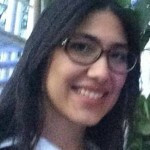 et al, 2011). Significantly, one cell type not identified as infected is the neuron. Eugenin et al (2011) demonstrate that astrocytes play a role on disruption of BBB: a few HIV-infected astrocytes (approximately 3.9% of those in vivo) compromise BBB integrity through gap-junctions (GJ). GJs amplify and spread toxic signals to uninfected cells. Thus, uninfected cells (astrocytes and neurons) surrounding clusters of infected cells undergo apoptosis. Through an unknown mechanism, HIV-infected cells are protected from apoptosis (Eugenin et al, 2011). Huang (2012) also identified a similar mechanism in which patients with Alzheimer’s disease (AD) perpetuate pathology through cell-to-cell spread and seeding of abnormal protein aggregation in experimental models causing neurodegenerative disorders associated with the A-b , tau and a-synuclein proteins. These properties have been compared to those of prions. Despite all these data, the mechanism underlying transfer of HIV-1 through blood-brain barrier is not clearly understood. (Sharma & Bhattacharya, 2009). The importance of this mechanism is that the HIV-1 virus found in the CNS a sanctuary in which it can be protected from the immune system and HAART. Because of HAART, HAND have diminished in severity. (Dash et al., 2011) However, milder forms of cognitive impairment frequently occur, despite effective viral control, such as brain volume loss, white matter injury, hippocampal involvement, metabolic disturbances, synaptic pruning and dendritic damage. (Xu et al, 2011). The brains of HIV-1-infected individuals reveal decreased expression of an integral protein in presynaptic terminals (SYN), of a marker for neuronal cell bodies and dendrites (MAP2), and of axonal NF in cerebral cortex. 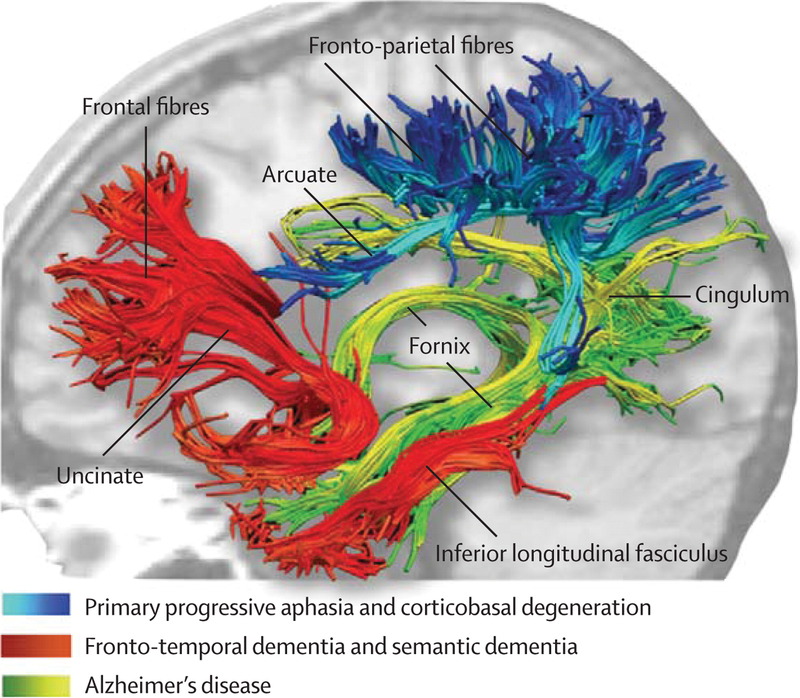 Such changes reflect substantive neurodegeneration (Dash et al., 2011). These findings correlate with the thesis of Huang et al. (2012), with which the loss of synapses and dendritic spines is better related to cognitive decline in Alzheimer’s disease (AD) than loss of neurons. Brain tissue structural alterations have also been found. Dash et al. (2011) observed an increase of fractional anisotropy (FA) in humanized mice with higher viral load and established immunopathology. FA is not very specific to the type of changes. In earlier stages of HIV-1 infection in humanized mice the changes observed could be associated with structural alterations of synaptic and dendritic processes. 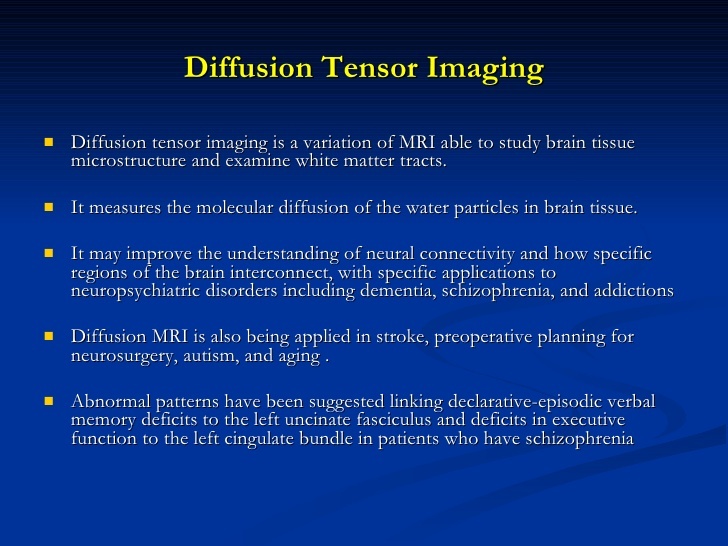 To observe the alterations, they used diffusion tensor imaging (DTI). DTI can assess displacement of water on the micrometer scale, yielding information about neurodegeneration such as with Alzheimer’s disease. (Dash et al., 2011). Glutamate is the major excitatory neurotransmitter in the mammalian CNS and it is related to basal excitatory synaptic transmission, neuroplasticity, learning and memory. This neurotransmitter has two classes of receptors: the ionotropic receptors (ion channels) and the metabotropic receptors (G-protein coupled). The ionotropic glutamate receptors are subdivided in three groups (AMPA, NMDA and Kainate receptors). In HIV infection, the NMDAr has particular importance because HIV-1 coat protein gp120, which is a potent neurotoxin encoded by the viral genome, enhances NMDA receptor activation through indirect and direct mechanisms. In relation to the indirect mechanisms, numerous reports have shown that HIV–gp120 upregulates NMDA receptor activity by enhancing the release soluble factors from glia such as arachidonic acid and proinflammatory cytokines. (Xu et al., 2011). Gp120 improves the trafficing and surface expression of NMDArs by enhancing the activity of both PKA and PKC through differential G-protein subunit signaling pathways. (Gupta et al., 1994; Zheng et al., 1999; Masci et al., 2003, at Hangxiu Xu et al., 2011) The NMDAr is a tetramer composed by two NR1 and two NR2 subunits. (Lynch and Guttmann, 2002; Waxman and Lynch, 2005, at Lauren A. O’Donnell et al., 2006) Phosphorylation of the NR1 C-terminus on serine 897 by PKA and on serine 896 by PKC has been shown to accelerate NMDA receptor trafficking. To verify this, Hangxiu Xu et al., 2011 showed that either PKA or PKC inhibition was sufficient to prevent gp120 from increasing NMDAr surface expression. Other two points relevant to the enhancement of surface expression of NMDAr are: a) pretreatment of neurons, in vitro, with gp120, which reduced the agonist-induced internalization of the receptor; b) disrupting the structure of lipid rafts after gp120 treatment restored agonist-induced internalization. (Xu et al., 2011). Also because the receptors appear as clusters when localized to lipid rafts domains and punctate (smaller amounts) when located to non-raft regions of the membrane, these data suggest that the stabilization and enlargement of lipid rafts inhibits the internalization of NMDArs. The over-expression of this receptor, especially in lipid rafts, may lead to death of neurons and glia cells because these receptors promote apoptosis by enhancing the influx of calcium. 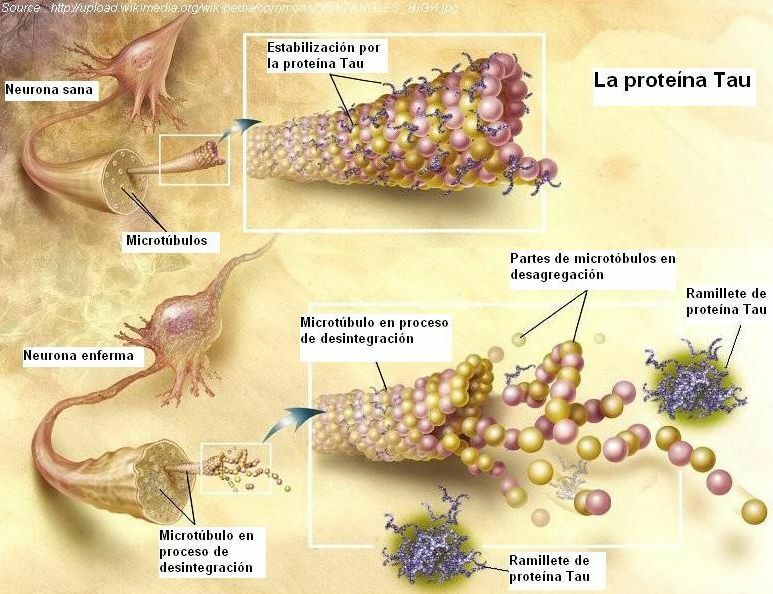 These mechanisms are similar to what happens in Alzheimer’s disease. According to Huang et al. (2012) the pathogenic interaction among tau, apoE4, Ab and α-synuclein suggests that there are mechanisms to which the effects of these proteins converge, including intracellular calcium homeostasis deregulation, mitochondrial impairment and downstream signaling cascades. The hippocampus, basal ganglia (such as striatum), and forebrain (such as frontal cortex), are particularly vulnerable in HIV infection because they are susceptible to NMDAR-mediated excitotoxicity. (O’Donnell et al., 2006) These areas are rich in NMDARs composed of NR2A and NR2B subunits. O’Donnell et al. (2006) demonstrated that hippocampal susceptibility to HIV excitotoxins is predicted by the presence of NR2A- and NR2B-containing NMDA receptors. These data suggest that regional susceptibility to HIV-induced cell damage might be primarily determined by NMDAR subunit expression. O’Donnell et al. (2006) also demonstrated that the NMDAr activation by HIV results in neuronal calpain activation. Activity of calpains is often associated with cell death models of ischemia, spinal cord injury, and a range of neurodegenerative diseases, such as Alzheimer’s disease and Huntington’s disease (O’Donnell et al., 2006). Tat is the transactivator of the HIV-1 long-terminal repeat (LTR) and is necessary for viral replication (Eugenin et al., 2003). Before Tat is present, a small number of RNA transcripts of the virus are made, which allow the Tat protein to be produced. Tat then binds to cellular factors causing its phosphorylation, allowing the increased transcription of all HIV genes (positive feedback). Tat has been associated with enhanced HIV-1 replication by participating in the NF-κB control of the virus’s transcription (Strazza et al. 2011). Then, this protein is secreted by infected astrocytes, microglia and macrophages (Kim et al., 2008) and is taken up by neighboring cells, including neurons (Karn, 1999) (Ensoli et al. 1993; Liu et al. 2000). Although there are indications that the neurotoxic effect of Tat in human neurons may result from its activity in the nucleus (Jeang et al. 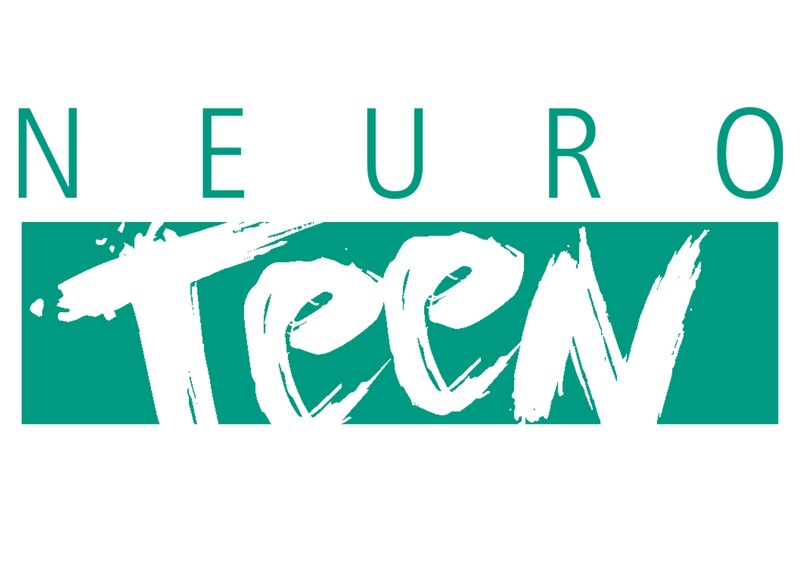 1999), Tat-induced neuronal damage appears to be mediated, in part, by processes that occur in milliseconds or seconds after Tat exposure and therefore, cannot be attributable to nuclear translocation (Eugenin et al., 2003). Indeed, NMDA, non-NMDA, Ca2+ and Na+ channels have been reported to be involved in Tat-mediated toxicity (Eugenin et al., 2003). 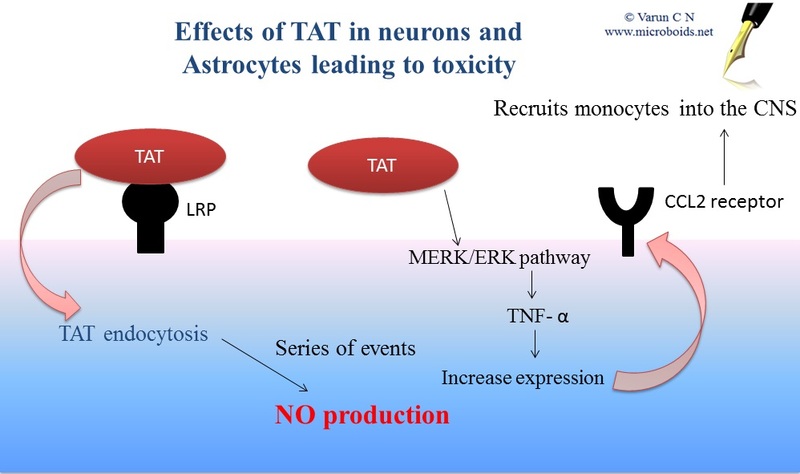 Tat can cause persistent activation of the NMDAr (like amyloid-β in Alzheimer’s disease) and it is suggested Tat induces apoptosis by direct and indirect interactions with this receptor. According to a model which proposes indirect mechanisms, Tat binds to the low-density lipoprotein receptor-related protein (LRP) (Liu et al., 2000) with subsequent activation of the NMDAr (Haughey et al., 2001; Song et al., 2003; Self et al., 2004). The resulting Ca2+ rise (Bonavia et al., 2001; Perez et al., 2001; Haughey and Mattson, 2002) activates neuronal nitric oxide synthase (nNOS) leading to cell death (Kruman et al., 1998). Indeed, the formation of a macromolecular complex involving LRP, postsynaptic density protein 95 (PSD95), the NMDAr and nNOS was shown to be an early step in Tat-induced apoptosis (Kim et al., 2008). According to models for direct mechanisms, Tat interacts with a specific polyamine site in NMDA channels of neurons and this interaction contributes to Tat-mediated neurotoxicity, probably due to positive modulation of NMDA channel activity (Eugenin et al., 2003). Tat-induced toxicity was most significant when NR1 subunit of the NMDA receptor was expressed with the NR2A or NR2B subunit (Li et al., 2008). The NMDA receptor is a heteromeric receptor channel that is formed of two subunits of NR1 and two subunits of either NR2A or NR2B. Midde et al. (2012) also described a mechanism in which Tat acts at the dopamine transporter (DAT) and at the vesicular monoamine transporter (VMAT2). These authors indicated that Tat regulates DAT function through a PKC-dependent mechanism that internalizes the DAT. The effect of Tat was also greater for VMAT2 protein than for the DAT protein. These findings may explain the increase in extracellular dopamine, which has already been proposed as one of the indirect mechanisms of the HIV-1 virus toxicity. Eugenin et al., 2003, show that two proteins, Monocyte Chemo-attractant Protein-1 (MCP-1 or CCL2) and Regulated upon Activation Normal T cell Expressed and Secreted (RANTES) inhibit Tat- and NMDAr-induced apoptosis in mixed cultures of human neurons and astrocytes by reducing the extracellular levels of glutamate and, in neurons, by regulating the intracellular trafficking of Tat and NMDAr subunit, NR1 expression. Tat also causes a proteasome-mediated degradation of microtubule associated protein 2 (MAP2) and the collapse of cytoskeletal filaments (Aprea et al., 2006), but the mechanisms are still unclear. VPR was initially studied as a neurodegenerative protein after it was found in brain of HIV-infected persons. Jones et al. (2007) concluded that VPR causes neuronal apoptosis, through cytochrome C release, p53 induction and caspase-9 activation, and also exerting a depressive effect on neuronal currents. They also determined, through mouse models, that the regions in the brain most affected by this protein were the basal ganglia, causing neurobehavioral abnormalities, and the cerebral cortex, causing aberrant motor activity. The main mechanisms of action of VPR described by Jones et al. (2007) are: changes in neuronal membrane potential; induction of the internal apoptosis pathway in neurons through direct interaction with mitochondrial membrane or indirectly increasing the load of Ca2+ inside the cell; and induction of secretion by glial cells of cellular neurotoxins. The changes in Ca2+-dependent BK channels caused by VPR can explain both the changes in neuronal membrane potential and the induction of apoptosis. So VPR is more closely related to the induction of apoptosis than the activation of the immune system. (Kramer-Hämmerle et al. 2005). Kramer-Hämmerle et al. (2005) have also shown that the effect of VPR injury is directly associated with the age of the infected patient. According to Vermeire et al. (2011), Nef is a key protein in rearranging the signaling and trafficking pathways of the infected host cell, acting in a way that increases viral replication and spreading of the infection. Nef physically interacts with specific cellular proteins involved in these pathways through its multiple effector domains. Many different biological effects result from these interactions and they all seem to cooperate in a two-pronged strategy to promote viral spread. First, by evading the anti-viral immune responses of the host and second, by directly enhancing viral replication by subverting T cell signaling pathways and facilitating T cell activation, Nef enhances the activity of the HIV-1 LTR promoter, which in turn may promote virion production. Also, Nef is thought to increase the release of viral particles by down-modulating the CD4 receptor on the virus-producing cells. Second, although still controversial, remodeling of the host actin cytoskeleton by Nef may promote the cell-to-cell transmission of virions. 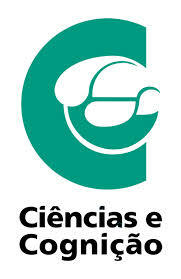 It has been suggested that Nef is capable of altering electrophysiological properties of neurons. Nef also causes monocytes/macrophages to release various proinflammatory factors. It affects mainly astrocytes by altering their biological properties. Stable expression of Nef is tolerated by astrocytes but Nef also modulates the sphingomyelinase signaling pathway triggered by TNF-α (Kramer-Hämmerle et al., 2005). According to Kragh et al. 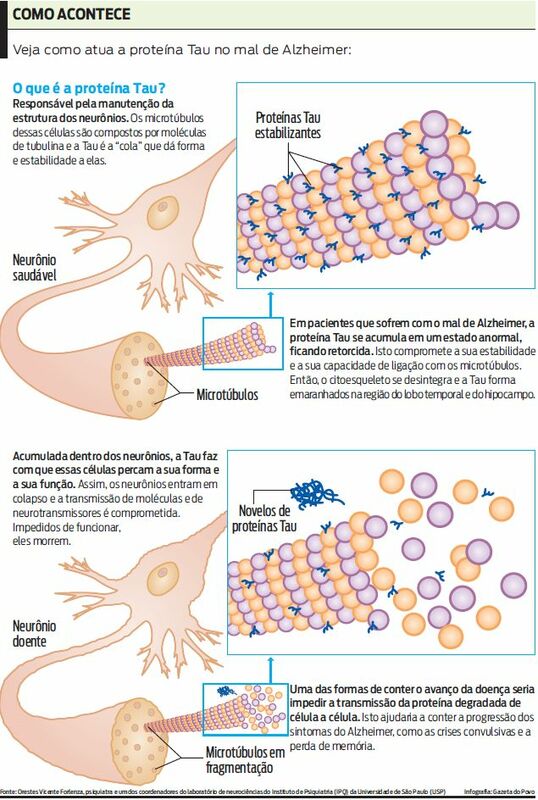 (2012), the Nef protein has an injury mechanism similar to that of Tau protein in Alzheimer’s Disease and α-syn protein in Huntington’s Disease. It has been shown that the Nef protein acts as an anti-autophagic maturation factor, blocking the lysosomal fusion, inhibiting its maturation. This mechanism can also stabilize a new intracellular compartment for the HIV biogenesis. 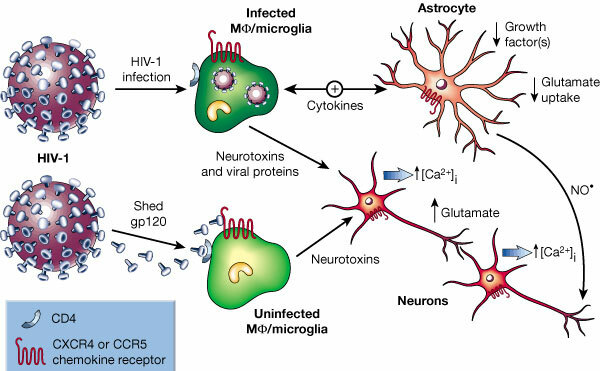 This article reviews direct mechanisms that lead to neurodegeneration in HIV infection. As AD is the most common neurodegenerative disorder (Niedowicz, 2011) affecting over 5 million people in the USA (Crews and Masliah, 2010), we propose to compare the mechanisms of neuronal death in these diseases. 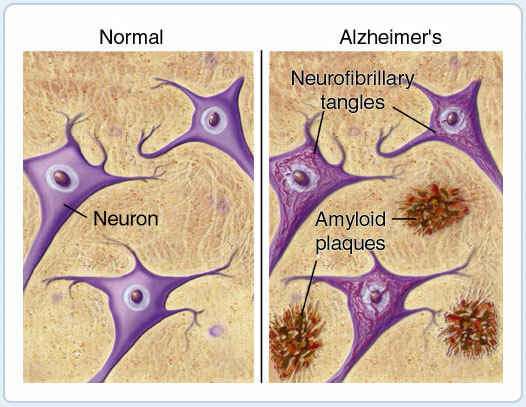 AD is characterized by cognitive impairment, progressive neurodegeneration and formation of amyloid-β (Aβ)-containing plaques and neurofibrillary tangles composed of hyperphosphorylated tau. The neurodegenerative process in AD is initially characterized by synaptic damage accompanied by neuronal loss. (Crews and Masliah, 2010). The Aβ peptide is produced from the larger amyloid-β precursor protein (APP). (Niedowicz, 2011). Abnormal accumulation of Aβ resulting in the formation of toxic oligomers is the result of an imbalance between the levels of Aβ production, aggregation and clearance. (Crews and Masliah, 2010). Most recent evidence indicates that soluble oligomers Aβ are the major cause of synaptic dysfunction and ultimately neurodegeneration. Soluble oligomeric Aβ has been shown to interact with several proteins, for example glutamatergic receptors of the N-methyl-D-aspartate (NMDA) type (like gp120 and Tat protein) and proteins responsible for maintaining glutamate homeostasis via uptake and release (Crews and Masliah, 2010) (Danysz and Parsons, 2012). Synaptic NMDA receptor activation is neuroprotective, whereas extrasynaptic NMDA receptors trigger neuronal death and/or neurodegenerative processes, as noted above. Recent data suggest that chronic activation of extrasynaptic NMDA receptors leads to a sustained neuronal amyloid-β release and could be involved in the pathogenesis of Alzheimer’s disease (Bordji et al., 2012). Strong support for the clinical relevance of such interactions is provided by the NMDA receptor antagonist memantine. This substance is the only NMDA receptor antagonist used clinically in the treatment of AD. (Danysz and Parsons, 2012) (Bordji et al., 2012) (Farlow, 2004). 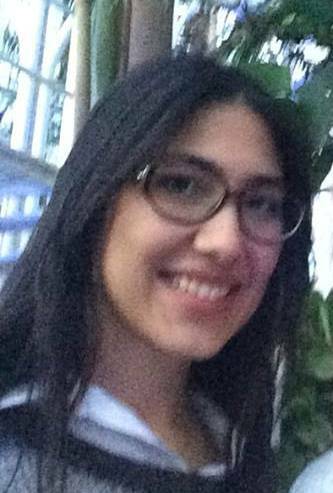 Bordji K, Becerril-Ortega J, Buisson A. Synapses. NMDA receptor activity and neuronal Aβ production in Alzheimer’s disease. 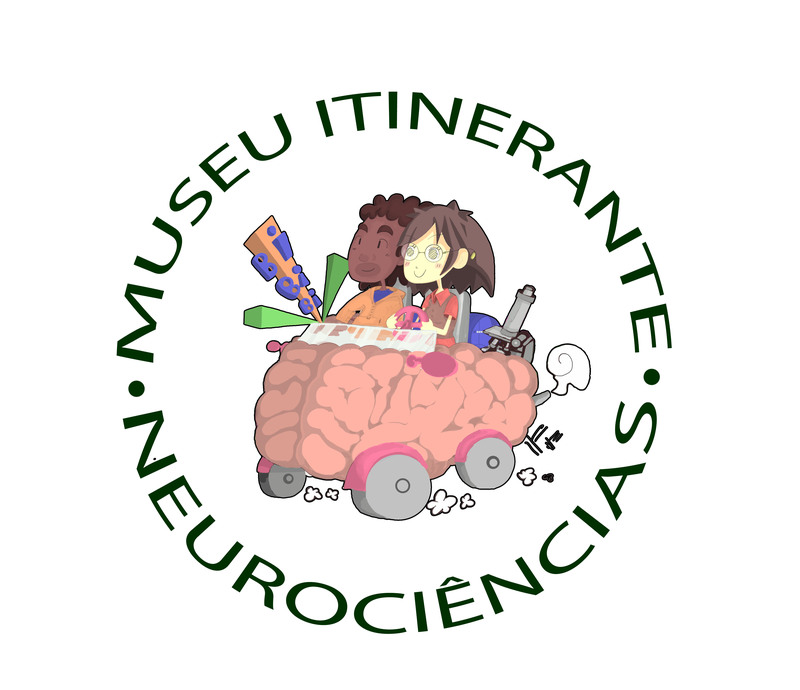 Rev Neurosci. 2011;22(3):285-94. Epub 2011 May 16. Danysz W, Parsons CG. 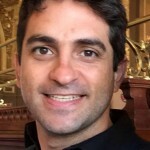 Alzheimer’s disease, β-amyloid, glutamate, NMDA receptors and memantine – searching for the connections. Br J Pharmacol. 2012 May 30. Eugenin EA, King JE, Nath A, Calderon TM, Zukin RS, Bennett MV, Berman JW HIV-Tat induces formation of an LRP-PSD-95- NMDAr-nNOS complex that promotes apoptosis in neurons and astrocytes. Proc Natl Acad Sci U S A 2007 104:3438 –3443. Farlow MR. NMDA receptor antagonists. 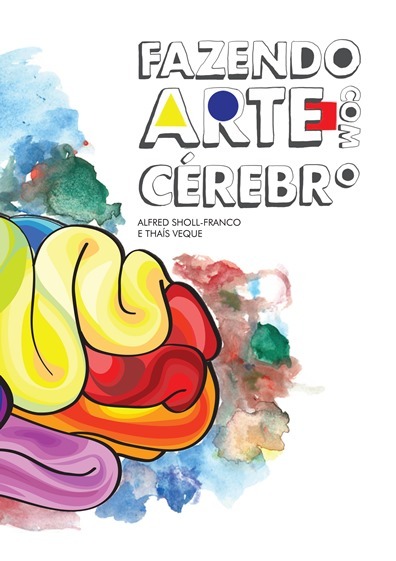 A new therapeutic approach for Alzheimer’s disease. Geriatrics. 2004 Jun;59(6):22-7. Kragh, C. L., Ubhi, K., Wyss-Corey, T., Masliah, E. Autophagy in Dementias. 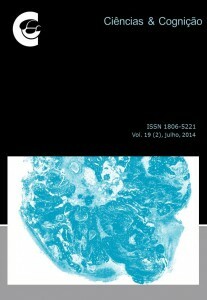 Brain Pathology 22, 99-109, 2012. Kramer-Hämmerle, S., Rothenarigner, I., Wolff, H., Bell, J. E., Brack-Werner, R. Cells of the central nervous system as targets and reservoirs of the human immunodeficiency virus. Virus Research 111 (2005) 194-213. Liu Y, Jones M, Hingtgen CM, Bu G, Laribee N, Tanzi RE, Moir RD, Nath A, He JJ Uptake of HIV-1 Tat protein mediated by low-density lipoprotein receptor-related protein disrupts the neuronal metabolic balance of the receptor ligands. Nat Med. 2000. 6:1380 –1387. Midde, N. M., Gomez, A. M., Zhu, J. HIV-1 Tat Protein Decreases Dopamine Transporter Cell Surface Expression and Vesicular Monoamine Transporter-2 Function in Rat Striatal Synaptosomes. 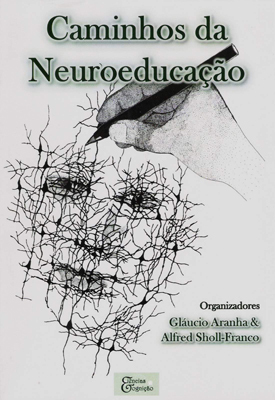 Neuroimmune Pharmacol, May 05, 2012. Self RL, Mulholland PJ, Nath A, Harris BR, Prendergast MA The human immunodeficiency virus type-1 transcription factor Tat produces elevations in intracellular is Ca2+ that require function of an N-methyl-D-aspartate receptor polyamine-sensitive site. Brain Res. 2004. 995:39–45. Marcado cognitive disorder, dementia, gp120, HAND, HIV, Nef, neurocognitive disorders, neurodegeneration, neuroinflammation, Tat.